The Head of Public Engagement sets the direction for APS public engagement programs in consultation with the Director of Education and Diversity and key APS leaders. This position leads public engagement programs, engages key stakeholders, and works synergistically with other program areas. Develops and advances high impact public engagement programs that embody APS priorities, in consultation with the department director and key APS leaders. Maintains deep knowledge of peer-reviewed literature, reports and other publications to inform program development. Evaluates the effectiveness of public engagement programs using best practices and makes changes informed by evaluation results. Writes proposals to fund public engagement programs and helps identify potential funding sources. Leads the public engagement team to implement programs and assumes primary responsibility for the success of public engagement initiatives. Serves as a liaison to the Committee on Informing the Public (CIP) and engages members in actively shaping and implementing the APS public engagement agenda. Serves as a liaison to the Forum on Outreach and Engaging the Public (FOEP) and other APS units interested in outreach and seeks to engage executive committees in working collaboratively toward common goals. Builds and maintains relationships with public engagement leaders in the science community and other organizations to understand trends, challenges, best practices, and opportunities. Collaborates with Education, Diversity, Careers, International Affairs and the Office of Governmental Affairs in areas of common interest, leveraging the expertise of other program areas to enhance public engagement initiatives and vice versa. Works closely with Communications to effectively reach target audiences. 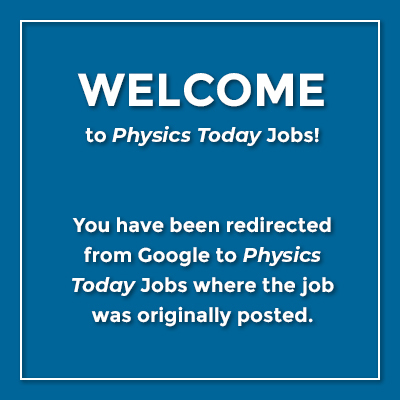 PhD (preferred) or MS in physics or closely related field is required. Additionally, a background in science education and/or science communication is desired. Five years of experience leading outreach programs or equivalent is required. Experience with proposal writing and project management is required. Supervisory experience is preferred. Possess a deep knowledge of public engagement, including effective practices and peer-reviewed literature. Strong, polished interpersonal, written and oral communication skills. Ability to handle several complex projects simultaneously, possess excellent organizational skills, and meet deadlines. Proactively identify and respond to needs, and exercise sound judgment. Computer skills and high level of proficiency in standard office software are essential. Customer service orientation desired, including ability to resolve conflicts constructively, and to empathize and understand perspectives and widely varying backgrounds of others. Demonstrate willingness and ability to work as a team player. Able to travel several times per year. Able to manage up, manage down, and manage across effectively. Demonstrate a collaborative style to engage committee members and membership units in advancing outreach objectives, and partner effectively with APS staff in synergistic areas. Build and maintain good relationships with key stakeholders in the public engagement community. Able to gather strategic input and use results of strategic analyses to identify new directions and refine existing programs, in consultation with the department director and key APS leaders. Competence in managing grants, proposal writing and budgetary management practices is required. Understand and employ principles of project management and program evaluation. Ability to allocate resources, delegate work, motivate people and resolve conflicts. Sensitive to the reactions of others and offer appropriate responses, so they feel their perspectives are heard and taken into account. Works closely with the Director of Education and Diversity and other department staff to develop and implement programs. Partners with Communications, the Office of Governmental Affairs, the APS Editorial Office, and other synergistic areas on outreach initiatives. Works with other APS departments as needed to support implementation of activities. Collaborates with relevant departments of AIP, AAPT and other scientific societies to advance outreach priorities. Engages with and supports physicists in academia, national labs and industry who conduct outreach. Engages with K-12 teachers and the public through direct outreach. The American Physical Society (APS) is a nonprofit membership organization working to advance and diffuse the knowledge of physics through its outstanding research journals, scientific meetings, and education, outreach, advocacy, and international activities. APS represents over 55,000 members, including physicists in academia, national laboratories, and industry in the United States and throughout the world. Society offices are located in College Park, MD (Headquarters), Ridge, NY, and Washington, D.C.